Well, I knew that I wasn't going to be able to finish all my food so I wanted to process my quince into a product that would keep for about a month...and decided on either quince jelly or quince paste. But since I have 5 types of jams in my fridge and I was too lazy to sterilize my glass bottles, quince paste would do. All i need to do is wrap it well and store in the fridge. As seen above, my fruit is beyond ripe and the skins are turning rubbery. Quince has been discussed widely on food blogs galore, so just to summarize, it looks like a cross between an apple and a pear and is too tart to eat raw. The root word of marmalade is a derivative of the Portuguese word, "marmelo" which stands for quince jam. That said, I found a recipe for membrillo, which is a basic quince paste/jelly eaten traditionally eaten with Manchego cheese. When cut, the flesh is white and upon cooking for a prolonged period of time, turns red. Mine, however, was already rosy and blush-colored uncooked. I modified the recipe. Like every other asian who favors mildly sweet desserts, I halved the amount of sugar, ie 1 cup quince paste to 1/2 cup sugar and zested more lemon into the mix (I have been OD-ing on zesting ever since I got my microplane!). I stirred the mixure under medium heat until the sugar melted. Added half a lemon. My mixture wasn't very wet, so I omitted the extra drying in the oven bit. I patted my cup of quince paste onto parchment paper and allowed to cool. 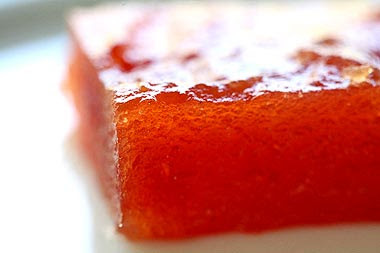 The end result is not the fine, elegant membrillo like below but it tastes really good nonetheless. It has a floral, nutty scent reminiscent of sweet chestnuts (?) + the chunkiness contributes to the nut comparison. If I had to troubleshoot, my quince was rubbery as mentioned and probably lost alot of moisture sitting around in my kitchen-> processor didn't make it paste-like because there wasn't enough liquid, I didn't have to dry it out->Chunky Membrillo :) Hmm, maybe when I get back I could add water and repeat the blending and cooking process to refine the texture further. For now, it will have to do.